Spray foam insulation has many advantages over traditional insulation products. Investing in PurAcell spray foam insulation will quickly payback the initial investment. PurAcell Sprayfoam insulation is the most efficient, effective and economical method of achieving superior insulation values and air-tightness on any building or retrofit project. Sprayfoam outperforms traditional methodology like fiber rolls, fibre batts and insulation boards. PurAcell sprayfoam insulation provides a custom fit solution every time with minimal labour, fast turnaround, and no waste. 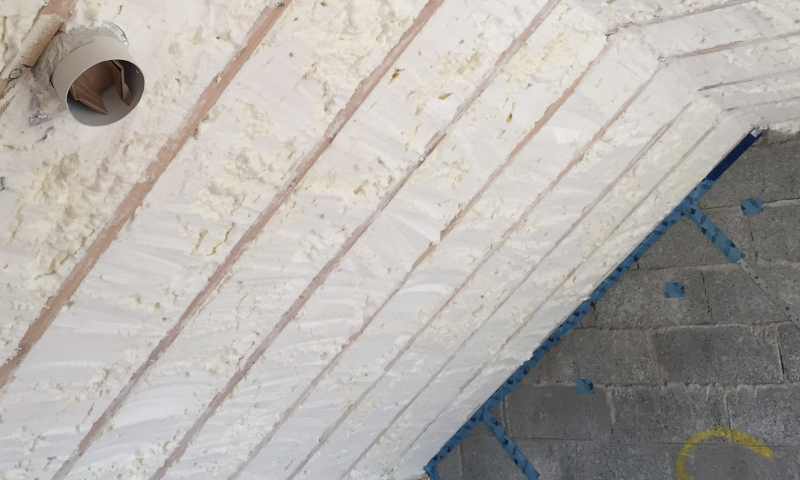 For new builds whether a domestic dwelling house or commercial building roof insulation is a key consideration for insulation. The decision taken at construct stage will impact for the longevity of the building and choosing the right product will save thousands of euros in the long term and enhance the comfort levels of the building. PurAcell Sprayfoam Insulation is ideal for dormer-type roofs where the habitable upper rooms are directly under the roof structure. Spraying from wall plate to the ridge on both sides, filling the rafters, will ensure a complete air-tight seal against air infiltration and heat loss ensuring a warm, snug, and energy efficient building. Whether your project is a new build or a retrofit, sprayfoam is the ideal solution for achieving both excellent insulation values and air-tightness all in one. Spraying the underside of the roof gives unparalleled insulation values and is fast becoming the norm in better building practices. Sprayfoam insulation is extensively used as the methodology for 'sealing the envelope' of timber frame homes while under construction. Spraying both the vertical timber stud walls and the roof ensures that the home is completely sealed from the elements and the heat locked in. Nothing is comparable to sprayfoam insulation in achieving the required thermal values. Many commercial, industrial, and agricultural buildings were traditionally built with galvanise or single-skin cladding. Condensation drips, particularly in frost weather, is a major problem during the winter months. Applying a 25mm coating of sprayfoam will completely eradicate this problem and enhance the heat-retention in the building. A lot of older commercial/industrial buildings are constructed with asbestos roofs. Asbestos poses no threat to health, provided it is not interfered with by cutting or removing, and may be handled by professionals who are trained to handle this product in a controlled manner. The asbestos dust from roofs can be harmful and the most cost effective and safe way to isolate the roof from the work environment is to apply a coating of PurAcell Sprayfoam. The sprayfoam layer encapsulates the asbestos, transforming the building into a healthier, safer and warmer work environment. Shipping containers, both 20' and 40', are often used for storage as well as a variety of other uses. Because of their single steel make up, condensation and eventual rust is a common complaint. An application of sprayfoam, normally to a thickness of 25mm, completely eradicates the condensation issue and leaves the container warm, snug, and dry. Boat and barge refurbishment projects usually require an effective unobtrusive layer of insulation for the retention of heat within the habitable area. The product of choice here is PurAcell Sprayfoam applied to the metal and between studs to which the finished panels are fitted. Closed cell sprayfoam applied at 50/75mm achieves excellent U-values where limited thickness is required. Sprayfoam is the preferred choice in buildings where temperature control is required - buildings such as vegetable stores and other agricultural/commercial buildings. The foam can be applied to any required thickness and will completely seal the envelope of the building. The system is more effective than double-skin panels, which still require sealing on completion. Spray foam insulation is one of the most flexible insulation solutions for the home in the market today. Spray foam is easy and effective to install in any household wherever they require insulation. Always make sure that it is a professional, certified, insulation contractor that does the work as they will be supplied with the correct equipment, training, and expertise to do the job professionally. Puracell spray foam insulation is completely maintenance free. Puracell insulation when applied to the property is immediately effective and creates a difference you will feel. With the ever-increasing demands to save energy and reduce carbon emissions, polyurethane sprayfoam is starting to be considered as a viable option over other conventional insulation systems. Recent research shows that poorly insulated homes and workplaces could be losing 25% of their heating through the roof of the property. Roofs insulated with Puracell sprayfoam insulation will significantly reduce monthly utility bills and save money in the long term . Air leakage is a common problem that results in higher heating and cooling costs for some property owners. 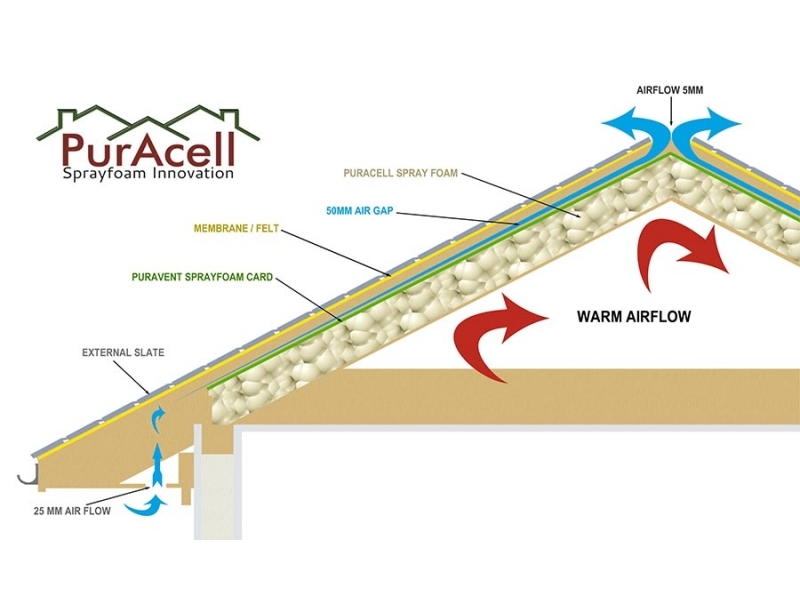 Puracell sprayfoam insulation application helps prevent air leakage, as the solution expands up to 100 times its volume to fill cracks and voids that otherwise would contribute to this issue. Selecting the correct type of insulation for improving air-tightness within a structure is an important decision as some insulation methods are more effective than others. By applying Puracell Spray Foam Insulation to your home you will receive the benefit of a much warmer home and at a much lower cost. 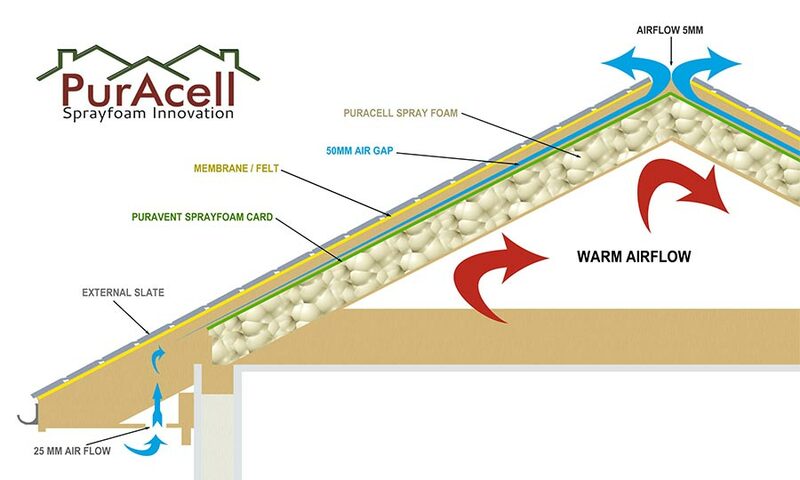 Puracell sprayfoam expands when it is applied and creates an airtight barrier to stop your warm air escaping from your roof. Because it prevents warm air from escaping your house will be considerably warmer and you will enjoy the benefit of lower heating bills. It is suitable for old and new buildings that require a lifetime long-term insulation solution. There are many direct benefits of old building insulation with our products such as reducing the risk of dampness and condensation in any old building big or small. Here at Puracell we offer a long-term solution for old building insulation with our sprayfoam products that remain stable over a very long period of time and restore your old building to a comfortable level. Our sprayfoam solution for old buildings greatly improves it’s insulation heat transfer coefficient and building insulation thermal resistance which does not degenerate as the years go by, reducing the need for periodic replacement as well as preventing those frequently-encountered problems such as moisture damage, rot, and an unhealthy dampness. When Puracell Insulation is installed into your home or structure it keeps conditioned air inside and unconditioned air outside. Therefore it will cost you less money every month to heat or cool your home. Puracell Insulation, when paired with other responsible building components, can help residential owners save up to 50% on their monthly utility bills. Over the past number of years Puracell foam insulation has become a commonly-preferred method of home insulation. We are insulation suppliers & contractors of a foam insulation system that is environmentally friendly and safe to use in the home. Suitable for individuals with respiratory conditions; Puracell insulation materials are suitable for individuals with conditions such as asthma because they do emit any gases or dust particles. When you use less energy through heating and cooling your home it reduces your carbon footprint. This is why more people are using Puracell sprayfoam insulation as their preferred method of insulation in the home today. There is no feasible way to eliminate all mould and mould spores indoors, so the most effective way to control it's growth is to control moisture. In buildings where mould is a problem, it must be remediated and the sources of moisture eliminated. This is where Puracell Sprayfoam may be used effectively. It seals the cracks, gaps, and crevices in the building’s structure and sheathing to create an air-tight space by reducing air and moisture flow from infiltration and exfiltration. There are environmental advantages as well; most notably, there aren't any fiberglass particles floating around in the air. 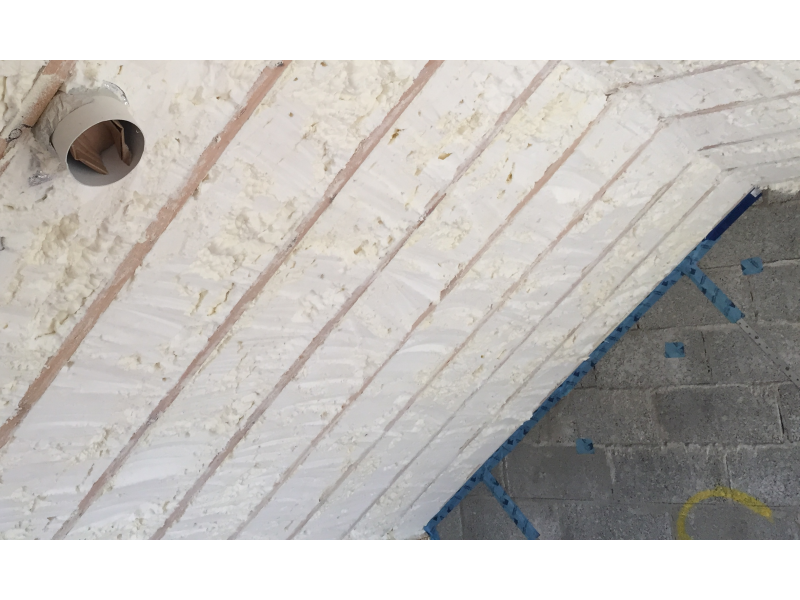 Puracell spray foam insulation unlike glasswool and fibreglass will not irritate the skin and will not sustain mold or fungal growth. When spray foam insulation is applied to a structure, it adds strength and stability.